Hi there my lovelies! Hope you are doing well. Today I want to talk about the look of the day. It’s a floral bohemian maxi slit dress from New York and Company. Description: With this beautiful dress, bring a dramatic look to your casual wear with this women’s chiffon maxi dress featuring a bold floral print. The dress boasts v-neck, elbow-length sleeve, and clinched waistline. Verdict: I absolutely love this dress. 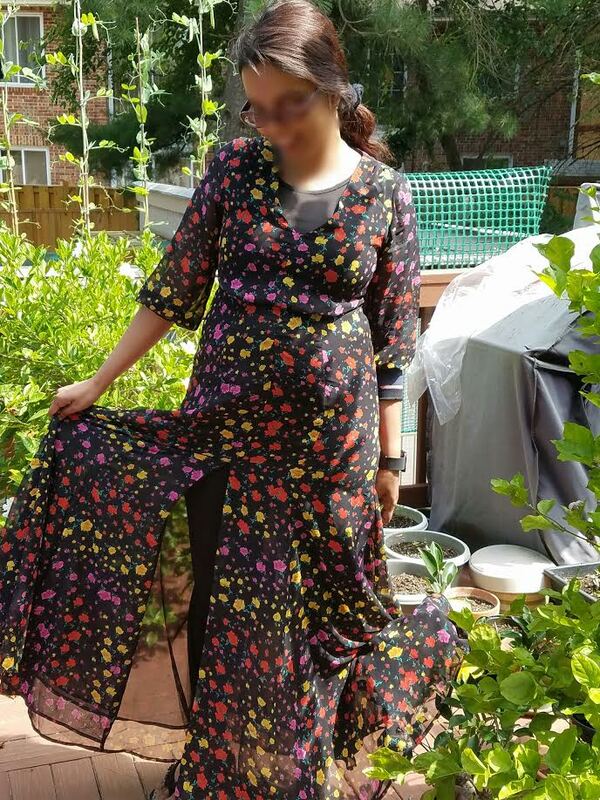 I bought this on clearance and love the floral print. I get a lot of compliments on this dress. It’s perfect for the weather. It’s not available at New York and Company anymore, but you can get a similar dress at Overstock.com. What is your favorite dress? Please comment below. I would really love to hear your feedback. Hi there my lovelies! Hope you are having a wonderful day. Today, I want to talk to you about my look of the day. It’s the floral shift dress from New York and Company. Description: This is a beautiful floral print dress with balloon sleeves. 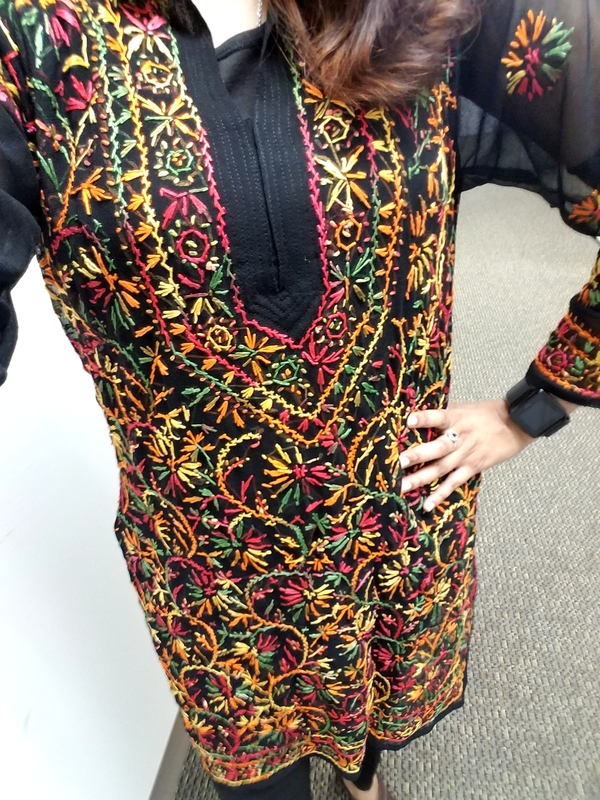 The colors are so vibrant and I have received a lot of compliments on this dress. This is a perfect outfit for the season. It’s so comfortable too! This a perfect dress for everywhere. Jewelry: This shift dress would go great with a chic choker or your favorite necklace. I wore mine with a long layered necklace that I had from a while back. What kind of outfit do you like? Please comment and let us know. I would really love to hear your feedback. Hi there my lovelies! Happy Hump Day everyone! Hope you had a wonderful Wednesday! While many states are suffering from a frigid temperature, here in Washington metro are we have been in the upper 60s and low 70s the past two while forecasting 2-3 inches of snow tomorrow. Since mother nature decided to lose her mind, I thought I would share today’s outfit of the day. 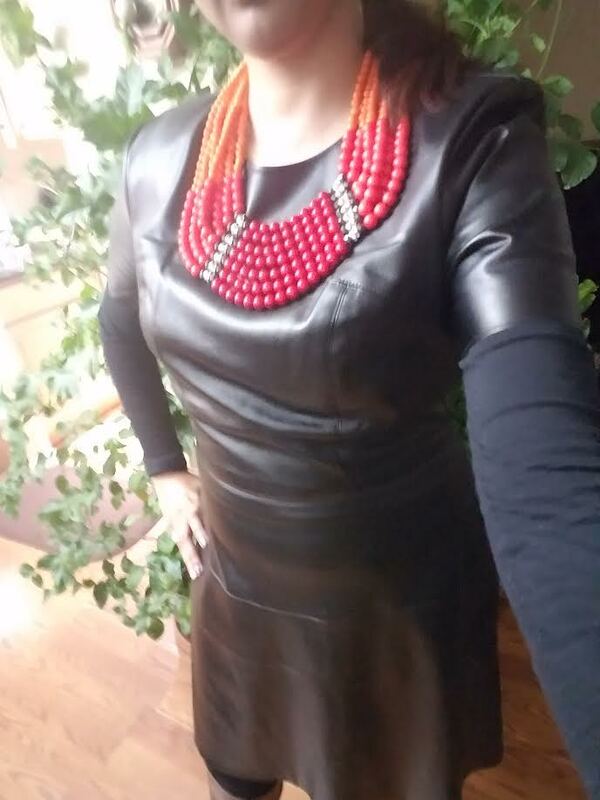 Dress: Today I wanted to go with a faux leather from New York and Company. Similar dress available from BCBGMAXAZARIA and Michael Kors. I love the chic edgy look that it creates. Boots: Nothing says style and sophistication like a classic leather tall boot from Bandolino. The Collyer two-tone riding boot is a timeless knee-high boot that will complement your casual style effortlessly! Get this gorgeous pair of boots at DSW for $99.95. The actual retail price of the boots is $149. You can also pair this beautiful dress with a nice pair of black heels. Either way you go, you are not going to be wrong. 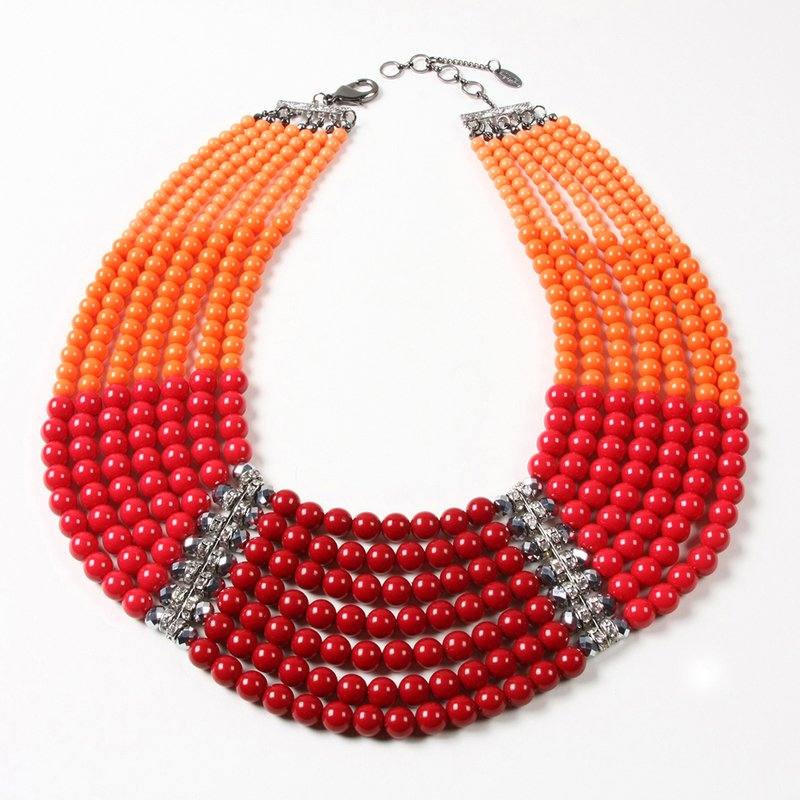 Necklace: Finally, complete the look by adding a bold necklace to the outfit. I love this necklace. I get a lot of compliment about this necklace. This bib design will reinvent all your favorite outfits. Hi there my lovelies! Hope you are having wonderful Saturday. I feel so blessed today to be part of a wonderful nation and world where millions of people gather together to right for their beliefs. 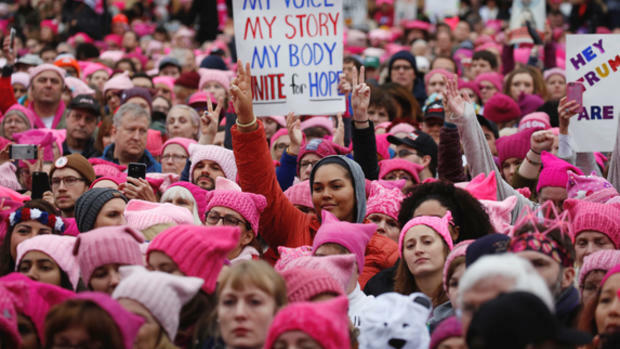 The Women’s March is bigger than any one of us. It’s about all of us and standing tall for our beliefs. 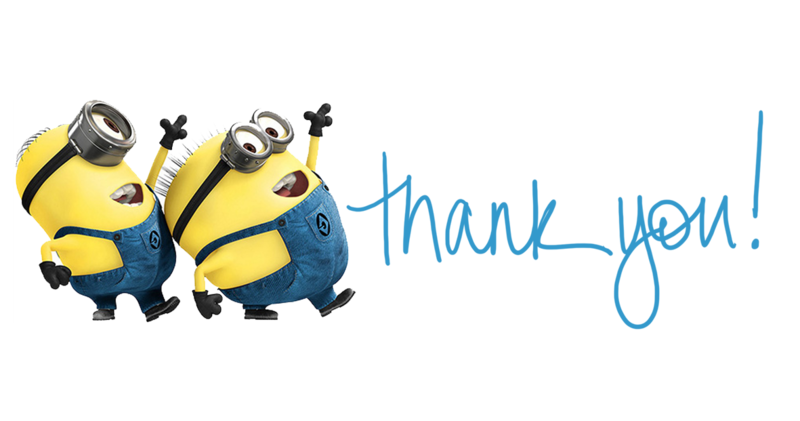 My beautiful readers, please continue to do what is right. It is my privilege and an honor to share and time with so many wonderful people. Do not stop now. Remember, as Robert Frost said, “Miles to go before I sleep”. With that spirit in mind, I want to share with your my style of the day in honor of the Women’s March. The Tunic: In order or honor feminity and celebrate all women and I wore this beautiful Simply Couture Sequin Bow-Back Tunic that I got from Zulily. I love the beautiful bubble gum pink color. I especially the bow design in the back. Necklace: I paired my tunic with the Pink Austrian Crystal & Silver Ballerina Necklace that I also got from Zulily. It also adds to the feminine look of the outfit. Jeans: I love everything about this outfit. I can pair it with my favorite skinny or boyfriend jeans. Today, I decided to wear it with my H&M boyfriend jeans to get a more relaxed look. 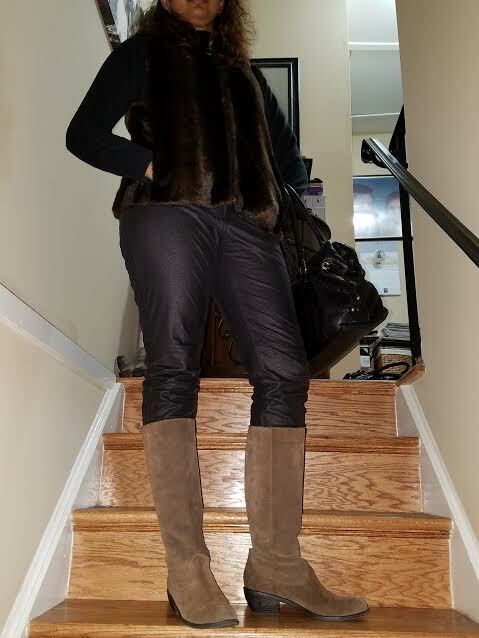 The Boot: Finally, I loved completing my look with my favorite pair of IDA’s ankle boot in Leather Lizard color from Fergie Boots. 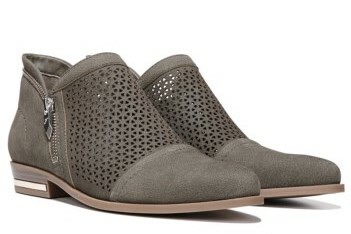 I love the perforated design of this leather boot. You can pair yours with your favorite boot. My wonderful and beautiful readers, what are you waiting for? Whatever you are fighting for, do it with style and spirit. Whatever you do, never give up. It doesn’t matter how we get there, but as long as we get to our destiny where our heart and soul it, that’s all matter. Keep fighting! At the end, that’s all matter. Hi There my Lovelies! Hope you are having a wonderful day. Happy Friday everyone. Today I want go over a very simple style of the day for work for those days when you have to those big meetings. It’s winter now and in fact we just had our first snow of the year today. Specially, during these time of the year I really hate wearing suit for those very important work meetings. Hence, I try to keep it simple and chic with sweater jackets. 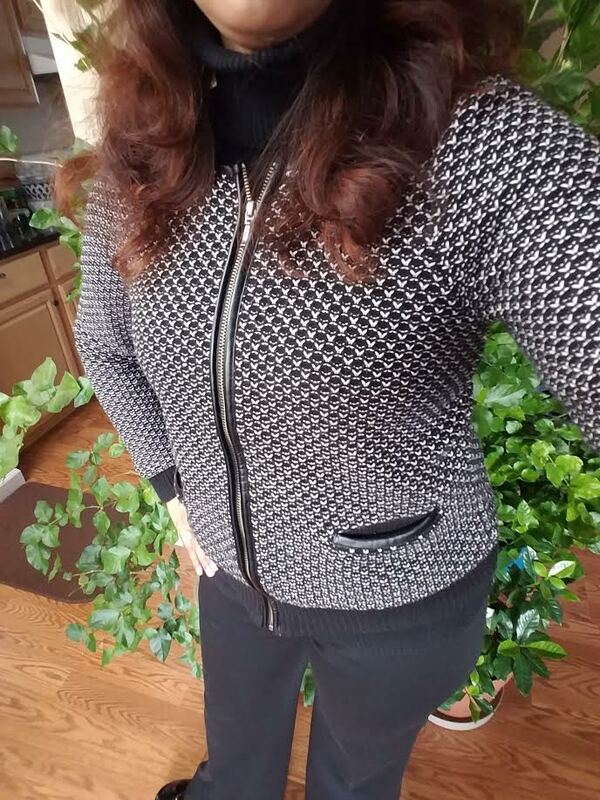 Jacket: I got my sweater jacket last from New York and Company and absolutely love it. It is like with faux leather creating a more chic edgy look to the outfit. I got a lot of complements for this sweater. I have also went to interviews and big presentation in Chicago, the Windy city (in November) wearing this sweater. If you don’t like wearing suits all the time but want to the chic look, get your favorite sweater jacket and face your meeting or any presentation with chic confidence. I have added some of my favorite examples to help you get started. Turtleneck: As you know I always love layering, specially during the winter. Whether you layer to achieve a certain look or to just stay warm, it never hurts to have fresh combinations on hand. When I layer, my goal is to achieve both. Depending on the weather , I like my sweater jacket with either a turtleneck or or my favorite mock neck short sleeve blouse. Whether, it’s turtleneck or just mock neck, I love how it add sophistication to any style. Pant: You always have to complete your look with the perfect pair of pants. I have gotten my pants from everywhere and Ann Taylor and Loft has by far the perfect pairs. I remember sister first introduced me to Loft pants a decade ago when she worked there a summer during my undergraduate years. I absolutely fell in love with how it fit me. Back then I was very skinny but a curve and both Loft and Ann Taylor knew how to fit my size. I absolutely love the Kate all-season stretch trouser from Ann Taylor, because of its curvy fit. What are you waiting for? If you are me and get tired of the same of suit, try these sweater jackets a try and let me know what you think. 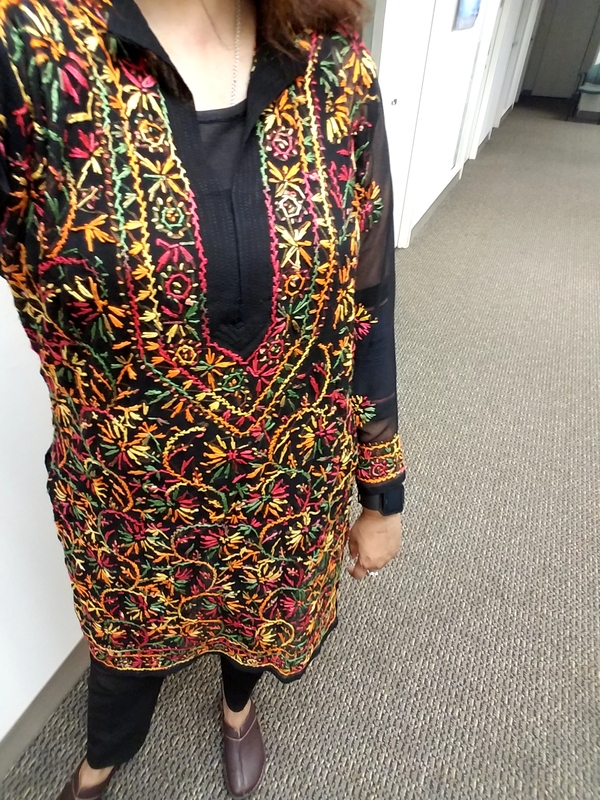 What are some of your favorite style for dressing up for the all important meetings and presentations? Hi There! Hope you had a great weekend. Like me, you guys might be worried about the current economics condition of our country. I for one, don’t want to let that impact my sense of fashion. Hence, I spent some time online, looking at places like Forever 21 and H&M to do some homework to see how can I keep my sense of fashion in budget. This is what I have so far. Let me know, if you have creative ideas that you would like to share. The above outfit gives you the style you need at a reason and affordable price. I have mention in a previous blog, stripes, high-waisted pants, and flares are going to be a major major trends this fall, and you can show off great fashion trends with breaking your wallets. The above outfit is not only fun and cost just little over $50. I for one find this style fun and affordable. I love it’s retro look of the side slit top. The high-waisted flare jeans are is hot right now and it cost less then $30. The above outfit is not only fun and cost under $50. The top has a fun layered look contrasted by the frayed chevron-pattern of the skirt. The outfit is fun and is affordable at the same time. The above outfit cost under $50. The top is stripped with fun with off-the-shoulder top and pairing with jogging style pants with patched pockets. You pair it with a nice heels and wallah, you a wonderful stylish outfit that will not break your wallet. Last but not least is the striped-trim ribbed dress which cost only $25. You are dress it up with heels or down with sneakers. I had a great time finding these fashion trends under budget for you guys and I hope enjoy it. I would love hear about your budget fashion styles. As for me, due to my Muslim upbringing, I would wear a black T-shirt under the mock neck side-slide top, like the textured knit crop top ($5). I would pair my chevron patterned skirt with embroidered lace boxy top ($18). I would pair the jogging style pants with jersey top in natural white stripe ($10). 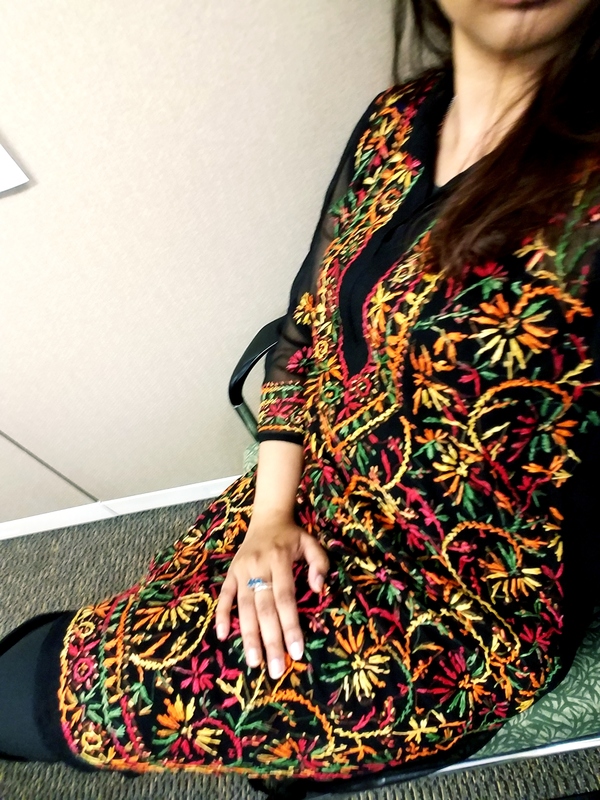 Finally I would add some color to my dress with organic cotton-blend legging in chestnut ($6). Hence, there is budget fashion for every style. I would love to hear about your budget fashion find.